Sharp images obtained by the Hubble Space Telescope confirm that three supernovae discovered several years ago exploded in the dark emptiness of intergalactic space, having been flung from their home galaxies millions or billions of years earlier. Most supernovae are found inside galaxies containing hundreds of billions of stars, one of which might explode per century per galaxy. These lonely supernovae, however, were found between galaxies in three large clusters of several thousand galaxies each. The stars' nearest neighbors were probably 300 light years away, nearly 100 times farther than our sun's nearest stellar neighbor, Proxima Centauri, 4.24 light years distant. "It would have been a fairly dark background indeed," she said, "populated only by the occasional faint and fuzzy blobs of the nearest and brightest cluster galaxies." "We have provided the best evidence yet that intracluster stars truly do explode as Type Ia supernovae," Graham said, "and confirmed that hostless supernovae can be used to trace the population of intracluster stars, which is important for extending this technique to more distant clusters." "Since there are far fewer stars in globular clusters, only a small fraction of the supernovae are expected to occur in globular clusters," Graham said. "This might be the first confirmed case, and may indicate that the fraction of stars that explode as supernovae is higher in either low-mass galaxies or globular clusters." "This is no love story, though," she added. "The companion was either a lower-mass white dwarf that eventually got too close and was tragically fragmented into a ring that was cannibalized by the primary star, or a regular star from which the primary white dwarf star stole sips of gas from its outer layers. Either way, this transfer of material caused the primary to become unstably massive and explode as a Type Ia supernova." This past March, scientists using the W. M. Keck Observatory and Pan-STARRS1 telescopes on Hawaii discovered a star shown in the image at the top of the page that breaks the galactic speed record, traveling with a velocity of about 1,200 kilometers per second or 2.7 million miles per hour. This velocity is so high, the star will escape the gravity of our galaxy. 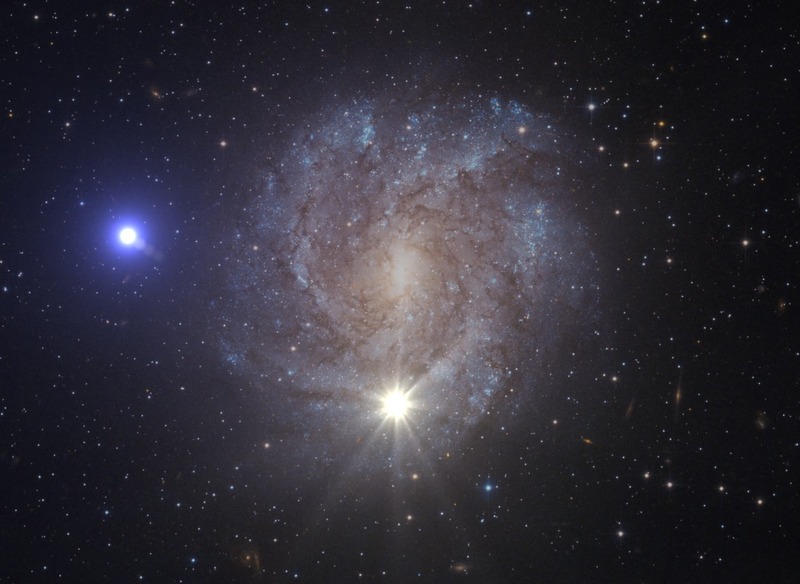 In contrast to the other known unbound stars, the team showed that this compact star was ejected from an extremely tight binary by a thermonuclear supernova explosion. Stars like the Sun are bound to our Galaxy and orbit its center with moderate velocities. Only a few so-called hypervelocity stars are known to travel with velocities so high that they are unbound, meaning they will not orbit the galaxy, but instead will escape its gravity to wander intergalactic space. A close encounter with the supermassive black hole at the centre of the Milky Way is typically presumed the most plausible mechanism for kicking these stars out of the galaxy. A team of astronomers led by Stephan Geier (European Southern Observatory, Garching) observed the known high-velocity star know as US 708 with the Echellette Spectrograph and Imager instrument on the 10-meter, Keck II telescope to measure its distance and velocity along our line of sight. By carefully combining position measurements from digital archives with newer positions measured from images taken during the course of the Pan-STARRS1 survey, they were able to derive the tangential component of the star's velocity (across our line of sight). Putting the measurements together, the team determined the star is moving at about 1,200 kilometers per second – much higher than the velocities of previously known stars in the Milky Way galaxy. More importantly, the trajectory of US 708 means the supermassive black hole at the galactic center could not be the source of US 708's extreme velocity. US 708 has another peculiar property in marked contrast to other hypervelocity stars: it is a rapidly rotating, compact helium star likely formed by interaction with a close companion. Thus, US 708 could have originally resided in an ultra compact binary system, transferring helium to a massive white dwarf companion, ultimately triggering a thermonuclear explosion of a type Ia supernova. In this scenario, the surviving companion, i.e. US 708, was violently ejected from the disrupted binary as a result, and is now travelling with extreme velocity. These results provide observational evidence of a link between helium stars and thermonuclear supernovae, and is a step towards understanding the progenitor systems of these mysterious explosions.